Son of Francis and Eliza Wallis. The family is recorded as living at Flint Cottage, High Street Banstead. Albert's brother Alfred Ernest Wallis survived the war. Memorial Reference: Panel 9 and 11. This panel is extremely high and difficult to photograph well. The photo shows the panel for the Grenadier Guards. 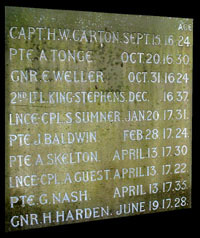 The inscription for Private W A Wallis is the 3rd one down on the left. Born in Polegate/Hailsham, Sussex, early 1884. Living at Albert Place, Hailsham in 1891. Disappears for 20 years. Married Nellie (probably nee Morton) from Waltham Abbey in 1910 (probably in Edmonton, Middlesex). In 1911, they were living at The Creamery, High Street, Banstead (3 rooms) where Nellie was manageress of the dairy and Albert was dairyman’s [foreman?]. They have a son, Edric, registered in Epsom district in third quarter of 1915. No further children. Derby Scheme man, enlisted in the 6th (Reserve) Royal Fusiliers in December 1915 at Banstead. Gave his address as Shirley, Lyme Regis Rd (which agrees with memorial book). Was automatically called up when conscription came into force in May 1916. He was made Corporal and after completing his training, he served (very briefly) with the 22nd Royal Fusiliers (29th Sept 1916 - 12th Oct 1916, a period which probably covered his travel time to France) and then with 32nd Royal Fusiliers (13th October 1916 onwards). There is some uncertainty over his date of death, the effects register and medal roll records 19th-22nd Sept 1917, SDGW says 22nd and All Saints memorial says 20th. The 32nd RF took part in an attack from the 19th-22nd in the Battle of Menin Road Ridge (part of the Battle of Passchendale). The 32nd were in support of the 10th Queen’s attack on the Tower Hamlets spur. The Queen’s were to seize their objective (the first, “Red”, and second, “Blue”, lines of German trenches) and then the 32nd would leapfrog them to take their objective trench (the third, “Green Line”). The 10th Queen’s suffered terrible casualties and were wiped out as an attacking force early on when caught in a bunch by machine-guns (the numbers are not recorded in their war diary but they had to be reinforced from many other units and only about 200 of the men still serving a few weeks later were originally from the 10th Queen’s). The artillery barrage was ineffective and too far in front of the 32nd Fusiliers and they - bunched together like the Queen’s were - came under considerable fire from undamaged machine-gun emplacements. They lost 36 killed, 8 died of wounds, 234 wounded and 29 missing, about 70% of those casualties before they even reached the Red Line (mostly bullet wounds). 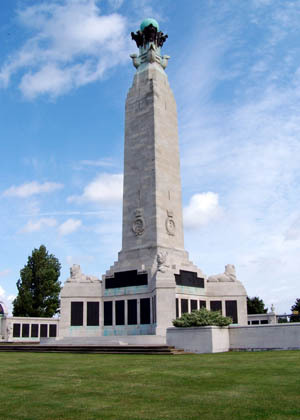 77% of officers and 60% of other ranks taking part in the attack for the 32nd became casualties. There were 22 decorations for bravery during the attack. If Albert survived the early stages of the action, it’s highly likely his officers were out of action, and as a corporal it would fall upon him to lead his section of men onwards. The officer commanding the 32nd’s report is critical of the lack of self-confidence shown by the non-commissioned officers once they lost their officers and of the lack of confidence that the men had in them, but even so their morale held up well enough to repel subsequent German counterattacks. Memorial Reference: Panel 28 to 30 and 162 to 162A and 163A. IDENTIFICATION ISSUES - Age? Link to Banstead area not yet established. Royal Field Artillery "A" Bty. 73rd Bde. Husband of Jessie Minnie Weller, of 9, Firtree Cottages, Pound Rd., Banstead, Surrey. Grave Reference: IV. B. 38. 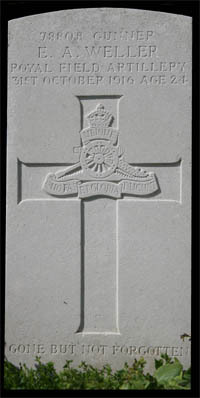 Headstone at DERNANCOURT photofraphed by Clive Gilbert in May 2008. Husband of Ethel Wigglesworth, of "Strathnavis," Ferndale Rd., Banstead, Surrey. Son of Stephen and Eleanor Sarah Wingrove, of Buff House, Banstead, Surrey. HMS Formidable was built at Portsmouth Dockyard, laid down March 1898, completed September 1901, and cost £1,097,245. 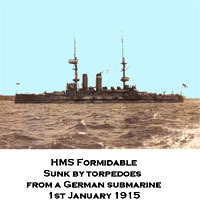 It was sunk by the Germans in the English Channel on 1 January 1915. The battleship was with the 5th Battle Squadron serving with the Channel Fleet. She left Sheerness on 30 December 1914 to take part in a firing exercise off Portland. HMS Formidable was struck by a torpedo on the starboard side abreast of her foremost funnel and sank with the loss of 547 lives. The first torpedo hit the number one boiler port side; a second explosion caused the ship to list heavily to starboard. Huge waves thirty feet high lashed the stricken ship, with strong winds, rain and hail, sinking it in less than two hours. Captain Loxley, his second-in-command, Commander Ballard, and the signaller stayed at their posts throughout, sending flares and rockets off at regular intervals. There was no panic, the men waiting calmly for the lifeboats to be lowered. Someone played ragtime on the piano, others sang. The Chaplain, (Revd. 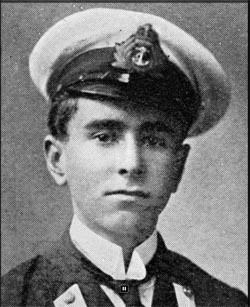 G Brooke Robinson who was formerly Curate of Burton Bradstock) went down with the ship by risking his life going below to find cigarettes. Suddenly the ship gave a tremendous lurch, the Captain shouted 'Lads, this is the last, all hands for themselves, and may God bless you and guide you to safety'. He then walked to the forebridge, lit a cigarette and, with his terrier Bruce on duty at his side, waited for the end, in true Royal Naval tradition. Burton and Bradstock village web site. Chatham Naval Memorial photos by Mike Shackel. All Saints plaque photo by Veronica Lansdale. Husband of Elizabeth Wiscombe, of 13, Shrubland Rd., Banstead, Surrey. Grave/Memorial Reference: IV. G. 18. KLEIN-VIERSTRAAT BRITISH CEMETERY Heuvelland, West-Vlaanderen, Belgium. Royal Field Artillery 112th Bty. Son of Mr. and Mrs. M. Wright, of "The Pound," Banstead, Surrey. The small wooden cross pictured on the right was laid at the All Saints Memorial in November 2006. Grave Reference: VI. M. 2.